Stainless steel flasks are great for the bachelor and Bachelorette parties, birthday parties, tailgating, concerts and more! This heavy stainless steel flask holds 6 fl oz; perfect for drinks on the go! 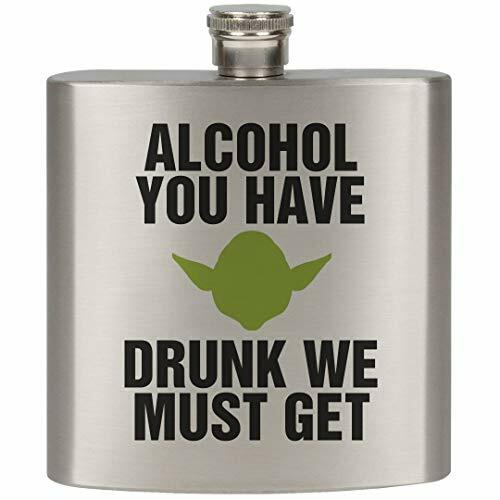 I don't think Yoda is technically an animal but a party animal? Absolutely! This cool flask is a great gift for those who love video games, sci-fi movies and more! Drunk Young Jedi get we must! If you have any questions about this product by FUNNYSHIRTS.ORG, contact us by completing and submitting the form below. If you are looking for a specif part number, please include it with your message.